I’ve probably mentioned this about a dozen times by now: the upcoming semester will be my last few months of college ever. I’m actually sort of excited because I saved my electives for this semester, with fun classes that genuinely interest me. I’m hoping that this will make it a little more stress-free. Lord knows that my last finals season was so crazed and wreaked havoc on my skin… I still don’t feel like I’ve completely bounced back! So for back to school, I’m going back to basics with some skin care staples that have always done me right so that I can start confidently. When I discovered the Simple Micellar Water earlier this year, I was hooked. It’s effective, yet gentle, and is perfect for year round skin maintenance. I personally use it to cleanse on no-makeup days, after mid-day workouts, and in the morning. It helps me avoid over-cleansing, which can freak out my combination skin, and keeps it feeling balanced. 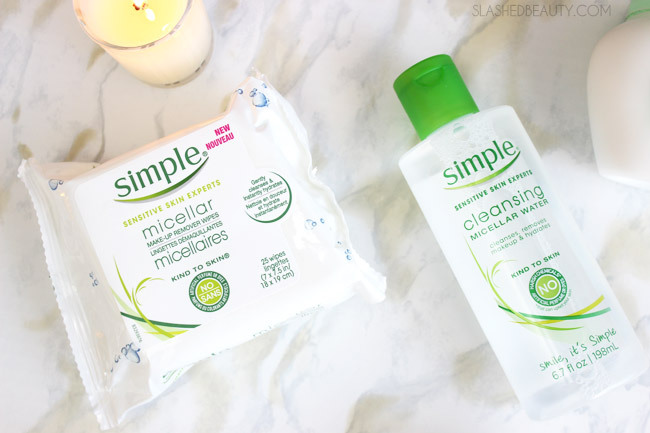 I’m pretty excited that they just came out with the Simple Micellar Makeup Remover Wipes, which have all the same benefits but with a more convenient way to use the formula. The best part about these two products is that they leave your skin feeling clean but never tight, and without residue. 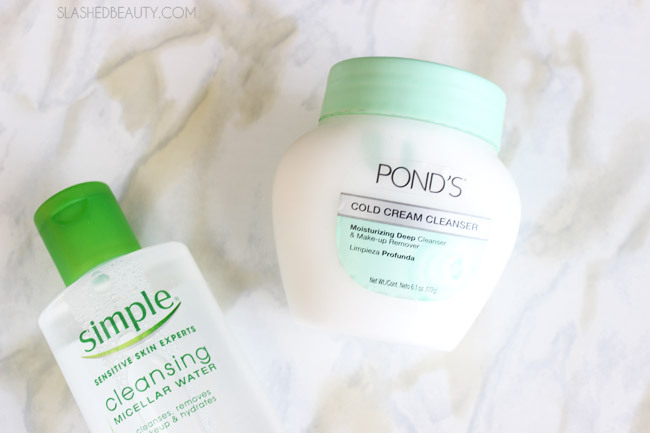 On days where I need something that will cleanse a little deeper for the hard-to-remove makeup, I haven’t found anything that beats out Pond’s Cold Cream Cleanser. This one always saves my skin during the changing of the seasons, when it’s most prone to imbalance. It acts as a cleanser and moisturizer all in one, and you hardly need a half-dollar dollop to cover your entire face. It can melt off even my most waterproof eye makeup while soothing my skin, and will keep things under control as we move into windy Fall. I couldn’t help but repurchase the St. Ives Even & Bright Pink Lemon & Mandarin Orange Scrub. I’ve been using this as my weekly exfoliant since last November, and it has done a great job at keeping dry patches at bay. It’s full of natural silica as the exfoliant, which feels great as it’s buffed onto the skin. I feel like it’s a bit gentler than St. Ives Apricot Scrub, but just as effective if not moreso. 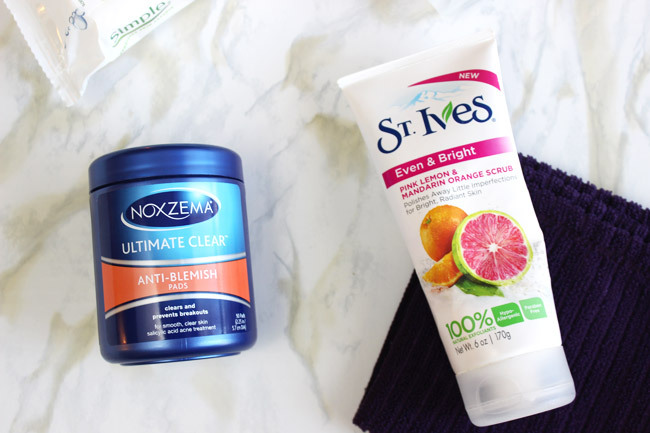 A new part of my back to school skin care routine is the Noxema Ultimate Clear Anti-Blemish Pads. I’m hoping these will be a good addition for treating my problem areas and keeping them clear. I think that the pads, which contain salicylic acid, will be more convenient to use than spot treatment since it can cover more surface and will layer more easily. I’ve been in a giving mood lately, so get ready for even more giveaways on the blog this week. Retweet below to win a bottle of the Simple Micellar Water and one pack of Simple Micellar Makeup Remover Wipes! Any US resident 18 years old+ can enter once by retweeting before THIS Saturday, August 15th. See full rules here, and don’t forget to follow me on Twitter while you’re at it. Good luck! What skin care staples will you carry into the new season? Next articlePrice Slash Alert: 40% off Sitewide at e.l.f. I’ve always been a huge fan of St Ives! I love Micellar water.. in a wipe? oh, I need to try that! I love those Simply makeup wipes. I got a kick out of seeing Noxcema and Ponds in your post since those go way far back. My mom used to use them even. A big fan here of Simple! I love it. I love Simple it is the best!